With little more than seven months to go, the Conservatives have the edge. Here's how you can keep track of what happens between now and election day. With little more than seven months to go before the October election, Justin Trudeau's Liberals are trailing Andrew Scheer's Conservatives in the polls. Their chances of winning re-election are no better than a coin-flip. But a month ago, the Liberals were in a strong position to secure a second term in office. Things can change quickly in public opinion, particularly when a controversy like the SNC-Lavalin affair blows up in an election year. Between now and Oct. 21, when Canadians are scheduled to go to the polls, voting intentions are likely to change again. And again. Over 150 national polls were published in the run-up to the 2015 federal election. The Poll Tracker boils those different surveys down into one set of numbers that can be tracked over time, providing a consensus view of all the data out there. That consensus currently gives the Conservatives the lead — their first lead in the polls since the prime minister's disastrous trip to India over a year ago. 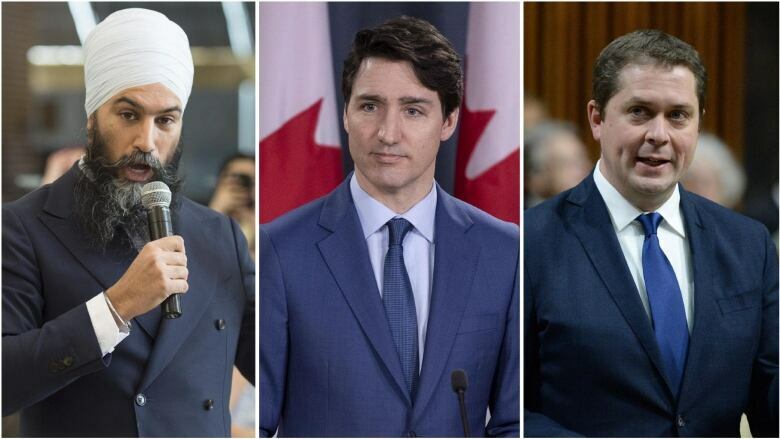 The Conservatives have made a modest gain at the expense of the Liberals, as have the New Democrats under Jagmeet Singh. But Scheer's Conservatives haven't yet reaped significant rewards from the Liberal Party's struggles. Their lead is primarily due to a drop in Liberal support, rather than a surge for the Conservatives. For the NDP, its polling increase still leaves the party in a precarious position; indeed, it's only now recovering from what was a new floor in its support. But the national numbers only tell part of the story. The Poll Tracker takes all of the regional data in national polling — as well as polls conducted in only one part of the country — to estimate where each party has its strength and weaknesses. The Liberals have taken a hit throughout the country. They still lead in Quebec and Atlantic Canada — though their margins over the Conservatives have shrunk in both regions. They've lost their edge in both Ontario and British Columbia. The Bloc Québécois and Conservatives have made progress in Quebec, while the New Democrats remain in danger of losing all of the seats they won in that province in 2015. The Poll Tracker's seat projection model makes it possible to draw reasonable conclusions about what current support levels in the polls would produce in seats. These estimates are made by shifting previous election results in each of Canada's 338 ridings by changes in regional voting intentions. With a narrow lead nationwide, the Conservatives are in the best position to win the most seats. 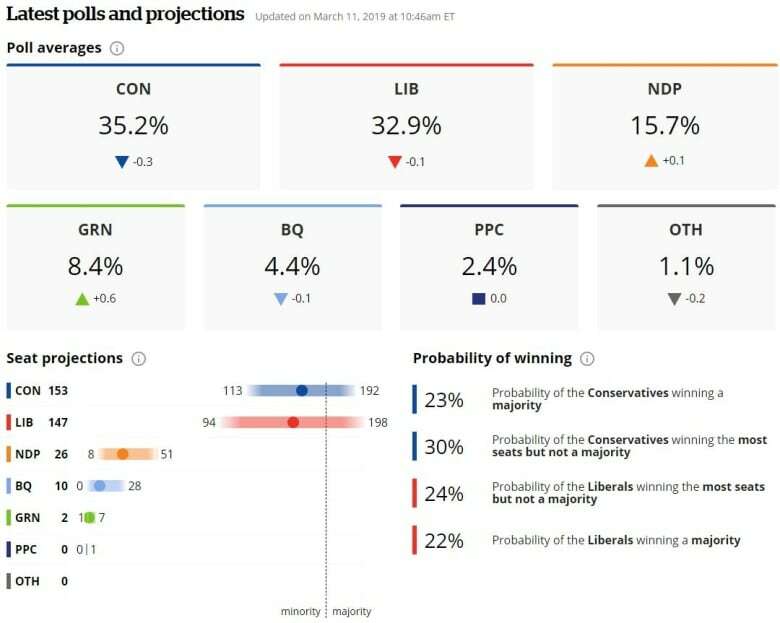 But the Conservatives' seat advantage over the Liberals looks narrow due to the regional breakdown of that support; both parties are in minority government territory. The New Democrats (who could lose nearly half of their seats) and to a lesser extent the Bloc could hold the balance of power in such a minority legislature. In fact, the Poll Tracker currently considers a minority government of one stripe or another the most likely outcome. On the question of which party would win the most seats in an election held today, the Poll Tracker sees a virtual toss-up between the Conservatives and the Liberals. It all depends on how the votes are distributed at the riding level — and how accurate the polls turn out to be. One of the benefits of aggregating polls is that it reduces the odds of drawing misleading conclusions from individual surveys that are subject to multiple potential sources of error. In previous provincial and federal elections, the Poll Tracker aggregate has out-performed most individual polls. Normal sampling error makes it inevitable that some polls will be closer to the mark than others, even if they're done correctly and are drawn from representative samples. But it's impossible to know for certain which of these polls will hit the bull's-eye beforehand — and which ones will prove to be outliers. The Poll Tracker tries to emphasize this degree of uncertainty. The polling aggregates and seat projections are expressed with 'confidence ranges' to indicate that a number of outcomes are possible based on the information available. The probability of each party winning is calculated in order to show which outcomes are more likely than others. Of course, the fact that a particular outcome is unlikely doesn't mean it won't happen. The Ontario Poll Tracker gave Doug Ford's Progressive Conservatives a 94 per cent chance of winning the most seats in June's provincial election, as turned out to be the case. In New Brunswick, however, the Poll Tracker accurately gave the Liberals a sizeable lead in the popular vote over the PCs, but just a 14 per cent chance that the PCs would emerge with the most seats. The PCs ended September's provincial election with 22 seats — one more than the Liberals. The unexpected can happen. Polls are an inescapable part of modern election campaigns. There are lots of them out there and they can contradict each other. 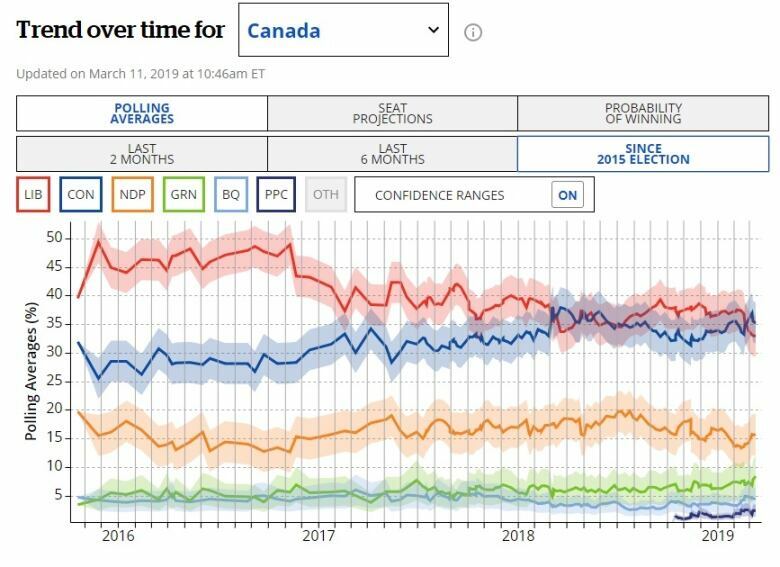 The Poll Tracker is designed to help cut through the noise and make some sense of the numbers in order to understand where Canadians stand — and why political parties do what they do. It's the kind of information parties use to draw up their electoral strategies. The Canada Poll Tracker tries to even the playing field in what could be a tumultuous election year.